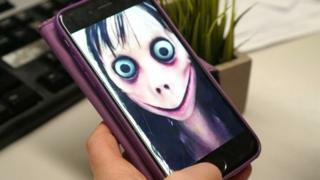 The fictional online character "Momo", which was alleged to have encouraged children to self-harm, has been described as a hoax. On Wednesday, police in Northern Ireland moved to reassure parents about the doll figure with bulging eyes. Momo was said to have targeted young children on social media. Various false reports said the doll contacted them on messaging service WhatsApp, then hounded them with violent images and dares. Ultimately, it was claimed, the post told them to take their own lives. However, charities have said they have received no reports of anybody receiving messages or harming themselves as a result.. They warned that media coverage has amplified a false scare story. Earlier this week, the police in Northern Ireland said that while headlines like "suicide game hits UK" might get thousands of clicks online, they "miss the bigger issue". "Great for a short-term shock effect, but not great long-term as it somewhat misses the bigger issue," said the PSNI in Craigavon in a Facebook post, which has since been deleted. A police officer claimed Momo was "run by hackers" seeking information. According to the false story circulating on social media, children are contacted on WhatsApp by an account claiming to be momo. They are supposedly encouraged to save the character as a contact and then asked to carry out challenges as well as being told not to tell other members of their family. The PSNI has said the danger lay with children feeling pressured to either follow the orders on any app by carrying out "challenges", or because of peer pressure in chat rooms. "This is merely a current, attention-grabbing example of the minefield that is online communication for kids," read the original PSNI Facebook post. "In 2017, it was 'Blue Whale', now it's 'Momo'. There'll be something else next." Police in the Republic of Ireland also raised concerns about momo, appealing to adults to supervise children and vulnerable people's online activity. A spokesperson for the NSPCC in Northern Ireland said: "The constantly evolving digital world means a steady influx of new apps and games and can be hard for parents to keep track of. "That's why it's important for parents to talk regularly with children about these apps and games and the potential risks they can be exposed to. "The NSPCC publishes advice and guidance for parents on discussing online safety with their children, as well as Net Aware - the UK's only parental guide to social media and gaming apps." You can find more advice and tips on how children can navigate life online at BBC Own It, which has been set up to help 8 to 12 year olds deal with anything they might encounter online. Update 28 February 2019: This article was originally published on 26 February and has been updated to reflect that fact-checkers now say that aspects of the "Momo" story is a hoax. Blue Whale: Should you be worried about online pressure groups?